Man Trucks India Pvt. Ltd. (“the Respondent”) was delivering the goods on Free on Road (“FOR”) basis at the premises/site of the buyers providing transportation services and had recovered the transportation charges from the buyers. The Appellant has been availing the credit of Service tax paid on transportation charges. The Department alleged that the Service tax paid on the freight charges for transportation of goods from the depot of the Respondent to buyer’s premises will not be eligible for Cenvat credit because as per Section 4(3)(c) of the Excise Act, in case of a manufacturer of excisable goods, the 'place of removal' is either the factory gate, or the depot from where the goods are sold to the customer and not the buyer's premises. The Hon’ble CESTAT, New Delhi relying upon the plethora of judgments and by observing various provisions in this regard, held that in the instant case, buyer has borne risk of damage to goods during transit and freight charges were an integral part of price of goods sold by the Respondent to its buyers. Therefore, buyer's premises will qualify as 'place of removal' for purpose of taking Cenvat credit of Service tax paid on transportation of goods. 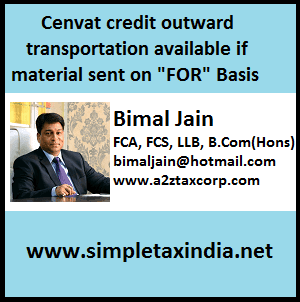 It has been held time and again that Cenvat credit on outward transportation is allowed in terms of Rule 2(l) of the Credit Rules when sales are made on FOR basis. In this regard, Para 8.2 of the Master Circular 97/8/2007-ST dated August 23, 2007 issued by CBEC, effectively equated the customer’s premises as a ‘place of removal’ in case of FOR sales. Further in order to remove the mist surrounding applicability of definition of ‘place of removal’ given under Section 4(3)(c) of the Excise Act, when duty is chargeable at specific rate was cleared by insertion of new sub-rule (qa) in Rule 2 of the Credit Rules vide Notification No. 21/2014-Central Excise (N.T.) dated July 11, 2014 (Effective from July 11, 2014). Furthermore, the CBEC vide its Circular No. 988/12/2014-CX dated October 20, 2014, has again clarified that ‘the place where property in goods passes on to the buyer’ is relevant to determine ‘place of removal’. However, the Trade and Industry is still facing the brunt of litigation on stated issue despite of plethora of legal pronouncements and CBEC’s circulars in this regard.